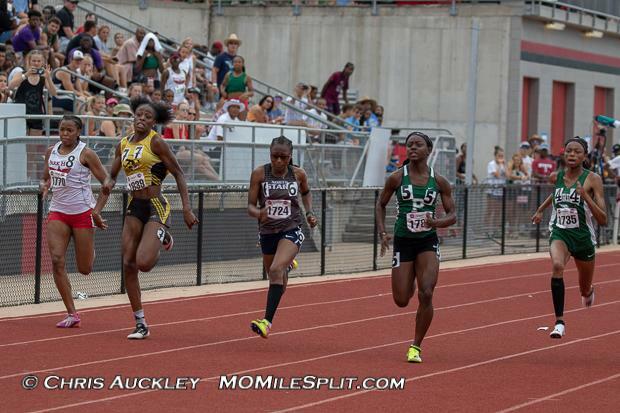 The top four finishers from last year, and nine total state qualifiers from last year return in the Class 5 Girls 100m dash in 2019. Jada Moore of Pattonville is the Defending State Champion, but will enter her senior season as an underdog. Junior Olympic Champion Alicia Burnett of Parkway North will return to high school track this season after sitting out 2018. Burnett owns a PR of 11.47 from her freshman campaign, and ran 11.61 last summer on the AAU circuit. She'll be the heavy favorite to win the Class 5 title this year after winning the Class 4 title in 2017. Defending Champ Jada Moore also ran on the summer circuit and placed 2nd in the 17-18 division of the 100m at the AAU Junior Olympics. She comes in with the third fastest returning time from last year with an 11.87. Courtney Williams of Nerinx Hall was last years runner up and returns with the second fastest time from last year with an 11.85 she ran at the Sectional Meet. Serena Williams of Battle (12.13), Lauryn Taylor of McCluer North (12.08), and Teresa Thomas of Park Hill (12.39) are the remaining returning State Medalists. Below you can find my subjective rankings and honorable mentions for the Class 5 Girls 100m Dash.